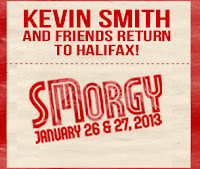 After slashing Day 2 and merging the 'casts into a single day due to TV commitments in LA, Kevin Smith has announced that the inaugural #SMorgy in Halifax is cancelled. The reason given [read it for yourself and see about refunds] is perfectly cromulent: his daughter Harley, now a 13-year-old bass player who's said of have some chops, has had her band advance to the finals in the local Battle of the Bands. In a dilemma worthy of a romantic comedy, @thatkevinsmith was forced to choose between the event that would take his brand to new heights of spectacle and respect, and the achievements of his pubescent daughter. Kevin, as much as everyone here will miss you, the Tell 'Em Steve Dave crew, Ming, Mike, the Mrs. and Ralph Garmin -- go be a dad. The only thing I can think of that would make your fans love you even more would be seeing you be an even bigger part of that girl's life. One tip: A band that can nail a Rush tune will win any Battle of the Bands. If their vocalist can do it, Red Barchetta. Otherwise, go with YYZ and be sure to tweet a picture of the trophy. Better yet, a video of the performance. I've been a Kevin Smith fan since a few days after I first rented Clerks from an indie video store on Yonge north of Eglinton in the mid-1990s. I didn't much care for it at first, but when a coworker began repeating some of the lines from the movie, I recognized how funny it really was. Mallrats was good, Chasing Amy was great. I really got into the Smith thing after watching An Evening With Kevin Smith, a video presentation of one of Smith's famously long question-and-answer stage appearances. Some years later, I'd be in the audience at Toronto's Massey Hall for the taping of An Evening With.... part 2, Evening Harder. I moved to Halifax and supplemented my radio pay by doing voiceover work for Eastlink, the local cable company. A fun lady named Meghan worked on the other side of the desk, running the recording equipment and coaching me on how they wanted the lines delivered. That's what producers do. She told me about a podcast called SModcast. Kevin Smith, she said, sounded high as a kite as he and his movie producer friend Scott Mosier, went on wild and hilarious trips of imagination. I loaded up my iPod with lots of SModcast and devoured the back catalog. Eventually Kevin expanded SModcast to a network encompassing other shows: Highlands, A Peephole History, in which he and friends gave an oral history of their small New Jersey town; Tell 'Em Steve Dave, where his buddies Walter and Bryan traded ball-busting insults; Blow Hard, which saw loudly gay Toronto documentarian Malcolm Ingram stumble drunkenly from misadvanture to misadventure. Further shows followed. SModcast became an empire and started touring. My Kevin Smith fandom never waned! When he auctioned off a crap-ton of View Askew stuff in the "sell the past to pay for the future" event, I bought the clapper from his Diet Coke commercial. Still in the box. Don't know what to do with it. Wife's not impressed, but that's life when you're a nerd. 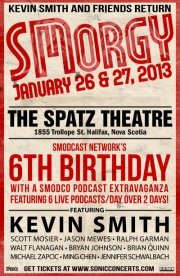 Now Kevin Smith is bringing the whole podcast family to Halifax for the first-ever SMorgy. It'll be a weekend of live tapings and other shenanigans at Citadel High's Spatz Theatre. For ticket information, see the Smodcast Smorgy web site. On Friday night, minutes after touching down at Halifax Stanfield Airport and before getting home after a lengthy Christmas vacation in Ontario, I dipped into the station for an exciting interview with Kevin Smith. We talked about podcasting, the intimacy of radio, the interestingness of integrity, and the legendary power of Rush. Nerdgasm. It was, at least from my perspective, a really deep and personal talk. Thanks to Kevin and his crewmates Jordan and Meghan for making this happen. I had a blast and would gladly have talked to him for another few hours.